Sloth Encounters - Earth Ltd. Registration for 2019 sloth encounters will open in spring 2019. Please check back soon for more information. Please be aware that sloth encounters for 2019 CANNOT be reserved or purchased before registration opens. Hang out with a two-toed sloth with our new sloth encounters at Southwick’s Zoo! 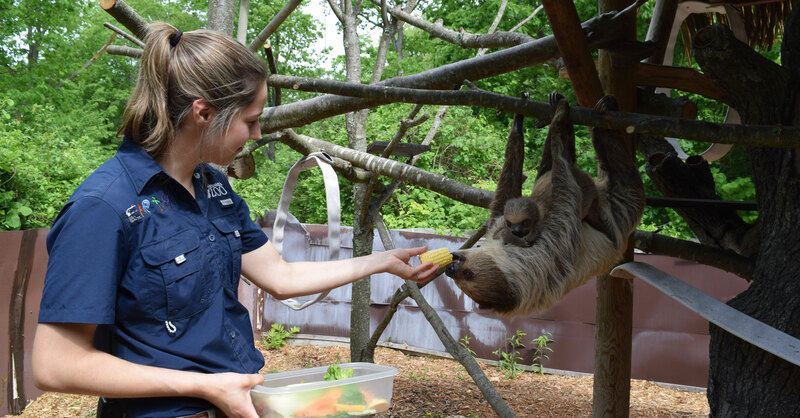 These encounters provide zoo visitors with the opportunity to meet one of our sloths up close. Half of proceeds from sloth encounters will be donated to the Sloth Institute, and the remaining proceeds will help support our educational programming at Southwick’s Zoo. Each encounter session will last approximately 30 minutes. Encounters begin with a brief talk focusing on sloth biology, ecology, and conservation efforts. Participants will then enter the sloth enclosure where they will be able to feed a sloth and possibly touch her. Please be aware that we cannot guarantee touching as it will depend on the animal’s comfort during the encounter. Participants will NOT be able to hold the sloths. *Spots are very limited and must be reserved online in advance. Zoo passes, coupons, discounts, or other offers cannot be applied to the price of sloth encounters. Note to members: To receive your member discount, click “enter promotional code” when you register. Your code is the first 5 letters of your last name + the first 2 letters of your first name. Example: John Smith’s code would be SMITHJO. If your last name is fewer than 5 letters, just use your full last name + the first 2 letters of your first name, Jane Doe’s code would be DOEJA. Note: Pricing for sloth encounters DOES NOT include admission to the zoo. Admission is required and must be purchased separately either at the zoo’s entrance or online. All Sloth Encounter participants must be at least 10 years of age. Only registered and paid sloth encounter participants are allowed into the sloth enclosure. Non-registered family and friends visiting the zoo are welcome to watch/take pictures from outside of the habitat however! Participants will not be able to hold the sloths. Please be aware that we cannot guarantee touching as it will depend on the animal’s comfort during the encounter. Each encounter date has a maximum of 4 people. We suggest wearing comfortable closed-toe shoes. We DO NOT recommend wearing flip flops or sandals. Sloth encounters take place rain or shine. Please be aware that, due to the limited availability, sloth encounters cannot be rescheduled. Zoo passes, gift cards, coupons, discounts, or other offers cannot be applied to the price of sloth encounters. We currently cannot take requests for custom dates/times. The only dates available are those listed on the registration page. Please note that sloth encounters cannot be reserved or purchased before registration opens for the season.